Whats the difference between Green Genie and Algae Strip? 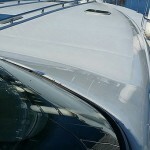 What is the difference between the bottom cleaner for fiberglass boats and green genie? Algae Strip is acid based and Green Genie, our latest invention, is salt based. They both work as well but Green Genie takes a little longer to work (30 minutes instead of 20). The acid based cleaners give off toxic fumes and you need to be more careful when working with it. Apply with a paint roller. 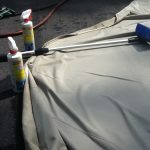 Green Genie is safe to spray as well as apply with a paint roller. It’s also more environment friendly. Most of our customers have switched to Green Genie. Algae Strip is still used for barnacle and heavy growth.